I was in Germany last in 2006 with 40 students from university. We visited Cologne, Frankfurt, and Heidelberg. The memories from that trip were incredible, but when it comes to remembering what the cities looked like, I have to think really hard. 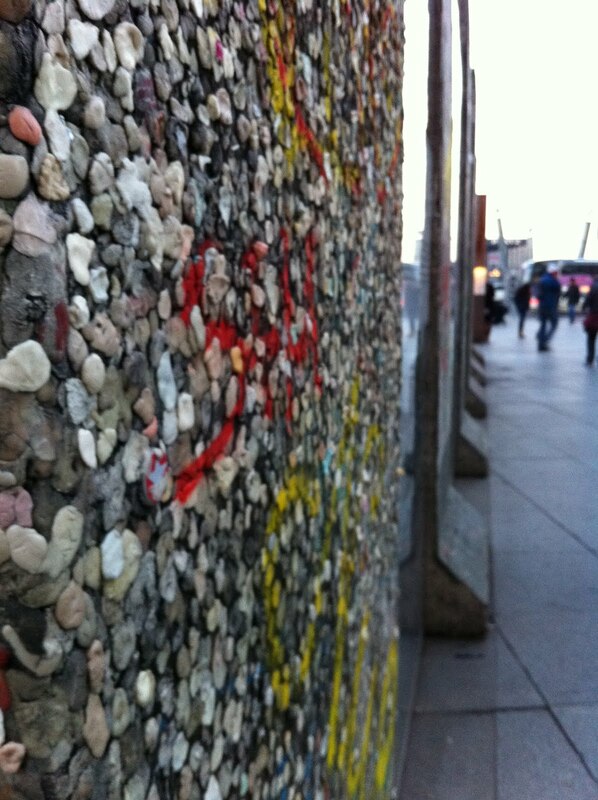 Work brought me to Berlin on Thursday and Friday. I absolutely loved it. When anyone travels, I think there are two main things that enhance a person’s experience. 2. How different that city is in relation to where you grew up, or where you’ve traveled to in the past. It was for the above reasons that I loved it. Firstly, the people. The administrator at the conference I attended made a positive comment about German hospitality and she was right! On my way from the Berlin Schoenefeld Airport to Potsdam, I was highly amused when on two different occasions, I was literally growled at by two female workers at two different train stations while trying to get directions in English. They then proceeded to laugh and tried their best to help me out. I realized that the growling probably occurred because they were frustrated that we couldn’t converse properly? Upon arriving at Potsdam, I got lost again, and asked the first person who gave me eye contact for directions. After using a mixture of German/English/sign language, he realized that I wasn’t getting it. He then kindly shoved me to the trams, and proceeded to accompany me on my short trip to the hotel! I was then highly amused and very touched when we got off the tram, and while I could clearly see that the hotel was just in front of me across the road, he tried his best to explain how best to cross the road, and that I should use the ramp instead of the stairs with my luggage! I must’ve looked like the worst lost person he’d ever come across! On Friday, as I was trying to get from Potsdam to Berlin, I proceeded to stop at this sausage deli for lunch. Now, anyone who knows me, knows how much I love sausages. Oh heavenly. 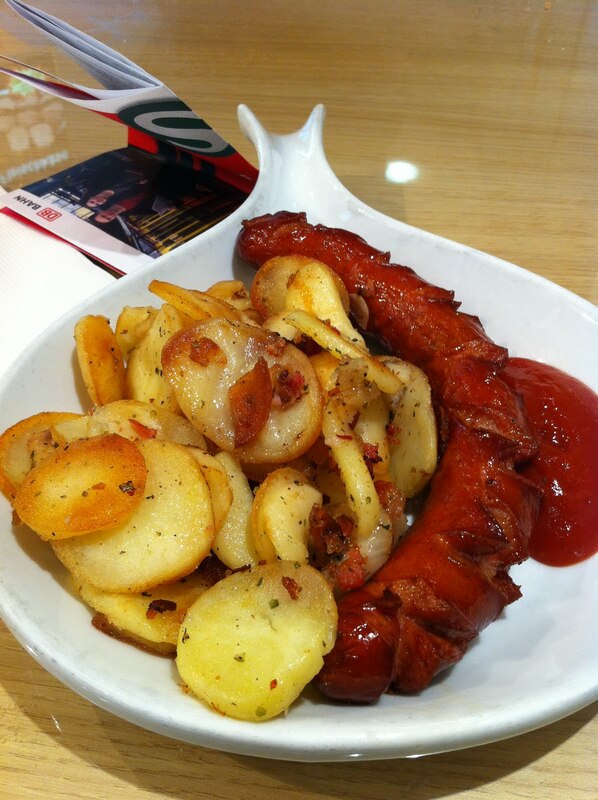 Sausages, sauerkraut and potatoes. Oh my lord! I sat down with my meal and realized that I didn’t have any cutlery or napkins needed to devour this thing. The deli was incredibly busy, and I was at a loss. This old man in front of me, in sign language, directed me to the cutlery station, and then to the napkin station on the other end. He then laughed and gave me a thumbs up signaling that I was now ready to eat! What a sweetie pie! Secondly, the city. Upon leaving the hotel, I had 3 hours to spare before my flight back to London, so I decided to walk around Berlin for a bit. I downloaded all the free apps I could find on Berlin and got a good idea of where I wanted to go. I decided to focus on the area South of the Berlin Hauptbahnhof where I would be able to walk down Eberstrabe and see the main landmarks – The Reichstag House, the Brandenburg gate, the Holocaust monument – and end up at Potsdamer Platz. 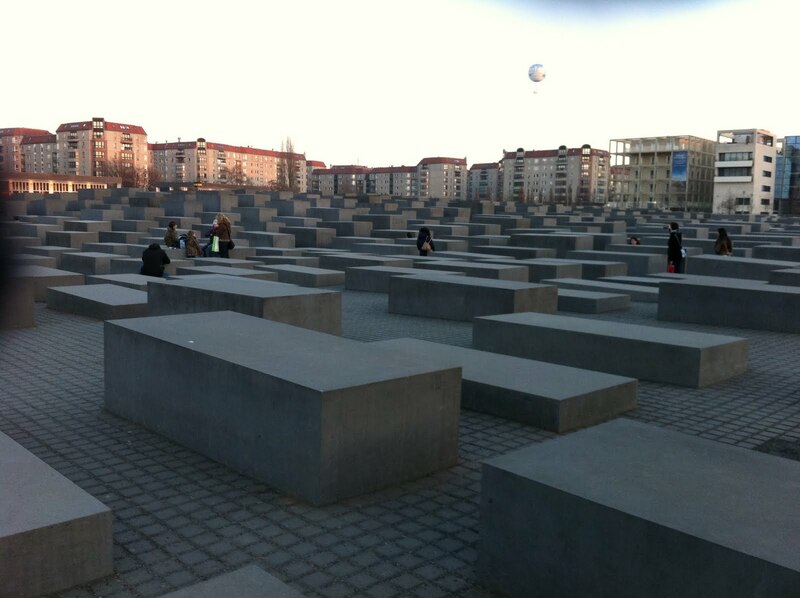 The holocaust monument – Field of Stelae- was incredible. It is an area the size of two football fields filled with 2711 concrete blocks. It is a pretty controversial monument; not many saw the need for it. I as a foreigner, disagree and think it’s worth every life that was lost in the war. It’s designed in such a way so that as you walk down a row of blocks, the ground slopes downwards, and the blocks get taller. So initially, as you enter a row, a block is the height of your knee, and in the middle, a block is 8 feet high. So the monument is meant to symbolize the fragility of the Jews, and as you walk through the pathways you are meant to feel trapped and uncertain of what’s around the corner. I spent a good 20 minutes soaking in the experience and listening to Kreuzberg by Bloc Party on repeat. 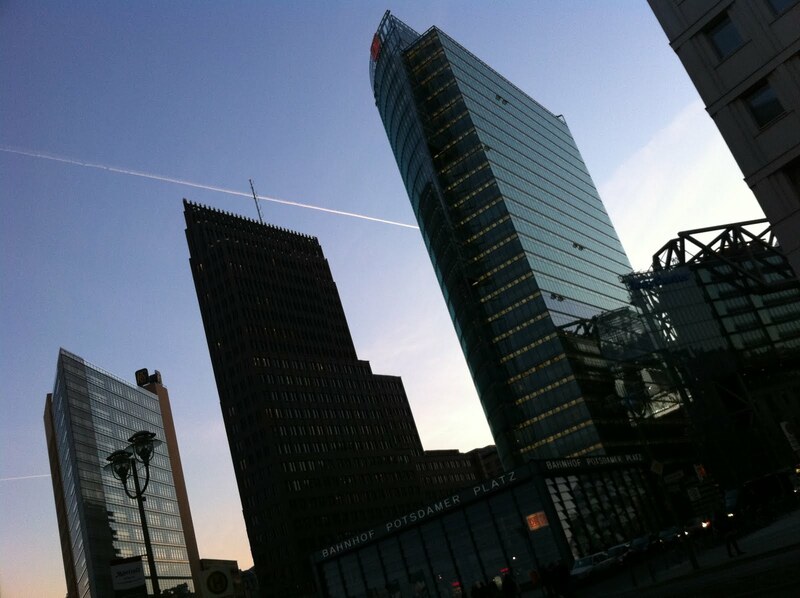 My last stop was Potsdamer Platz. It used to be no man’s land between East and West Germany, but has now been transformed to becoming Berlin’s commercial center. It definitely sounded and looked like the Canary Wharf of Berlin. 🙂 Sure the buildings were great, modern, and of great design, but I was more interested to see the remains of the wall. I get really silly with things that don’t exist anymore, and there in front of you, you have a fragment of what’s left. And so I stood in front of the 5 pieces of concrete wall, and stared and stared, at the graffiti, and let my imagination run wild. Shame I didn’t have more time on my hands. I would’ve attempted to experience the afternoon Kaffee and Kuchen culture! Indeed! 🙂 Could you send out a mass mail? Good post, and completely agree about German hospitality! Such an interesting blog i-Li-Ruthie. I feel like i traveled with you everywhere. Next visit after Almaty should be Moscow and StP!!! Mmm those sausages look good. I love the story of that old man too. I went to that Holocaust monument as well. Okay, blog spam but here's the blog post. I read that the monument's designer wanted it to convey a sense of hope, which took me a while to see! read your blog! nice that you were able to walk thru the entire thing. I had my suitcase, so I ventured mid way and was conscious of the loudness of the suitcase on the cobblestone-like pathways disturbing other people's experience..